Amongst other points of interest, Ireland is known for its passage tombs, which are ancient narrow passages constructed of large stones and one or more burial chambers covered in earth or stone. 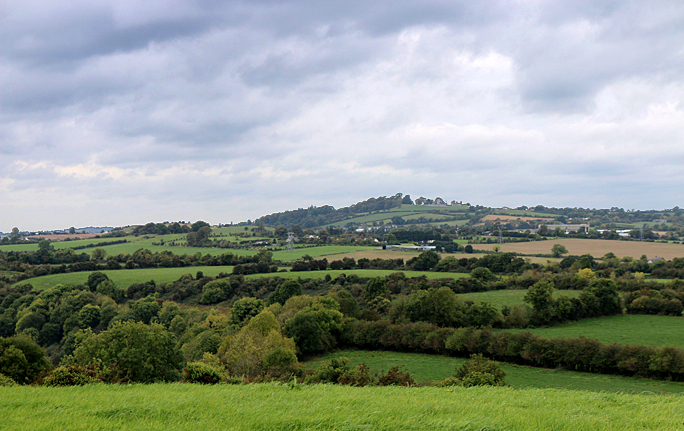 Two of them which I had visited are Newgrange and Knowth — both on the same cloudy, chilly and dreary day, which is perfect for visiting passage tombs. 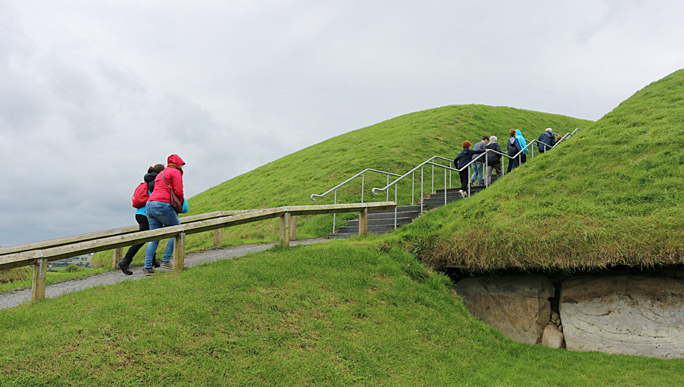 Visitors enter the passage tomb of Newgrange. Photograph ©2014 by Brian Cohen. Predating Stonehenge in England by hundreds of years, Newgrange is the best known passage tomb in Ireland, as it dates back to approximately the year 3,200 B.C. Although I had been to Stonehenge, I had not heard of Newgrange until it was recommended to me by someone I know who resides in Ireland. However, one of the people with whom I went to Newgrange had been meaning to visit for years. Access to Newgrange is only available by a bus which departs from the visitor centre to the site itself. 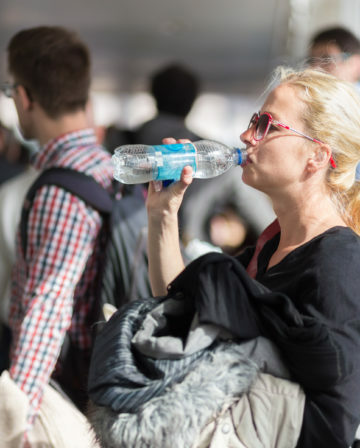 The bus ride takes several minutes — although waiting for it to depart can take longer than the short trip itself. The visit itself takes approximately 90 minutes or so. You cannot enter the passage tomb without an official guide; and due to the popularity of the site, time is limited once inside. No photography is allowed inside the passage tomb — even without a flash. The large mound is approximately 80 meters in diameter and is surrounded by 97 stones at its base — the most impressive of which is the entrance stone shown in the photograph below. Entrance to inside of the passage tomb of Newgrange. Photograph ©2014 by Brian Cohen. 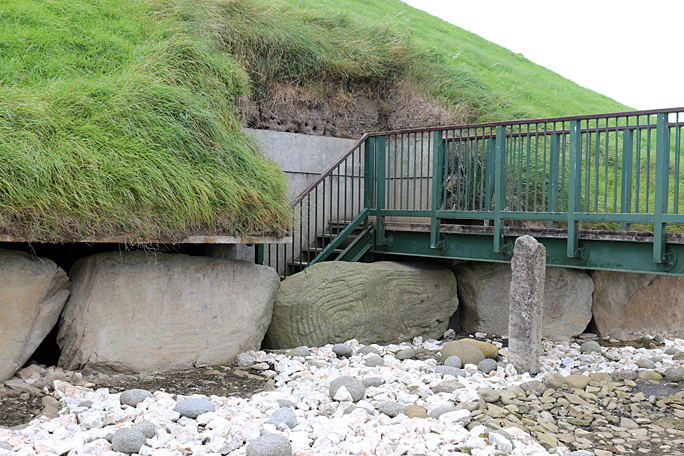 Notice the small opening known as a roof box situated above the entrance to the passage tomb. At dawn on December 21, which is the winter solstice — the shortest day of the year — and for a number of days before and after, a shaft of sunlight enters the chamber through an opening in the roof box. The winter solstice marked the start of the new year to the people of the Neolithic culture of the Boyne Valley. Although it may have served other purposes — part of the myriad of mysteries which surround Newgrange — it was considered a sign of the rebirth of nature and a promise of renewed life to crops, animals and humans. Because the winter solstice occurs only one time per year, it is impossible to witness the shaft of sunlight which enters the chamber inside the passage tomb. 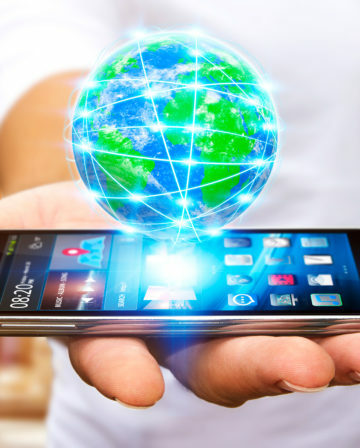 The official guide can emulate the effect with the flip of a switch, where a yellow electric light bulb simulates the sunlight. A lottery is held every year where if chosen, visitors can be inside the passage tomb during the winter solstice — but many people participate in the lottery, so chances are slim that you will be able to attend. There is no reason not to try if you are truly interested, though. Entry into the passage tomb itself is narrow; and you have to bend forward so that you do not bonk your head. Once inside the small chamber, you get to see the ancient artwork carved in the stone walls and marvel at how the roof remains impervious to leaks from outside precipitation thousands of years after it was first constructed. Unfortunately, there is also graffiti carved into the stone walls as well. At one point, all illumination was turned off, which enveloped us in almost complete darkness. 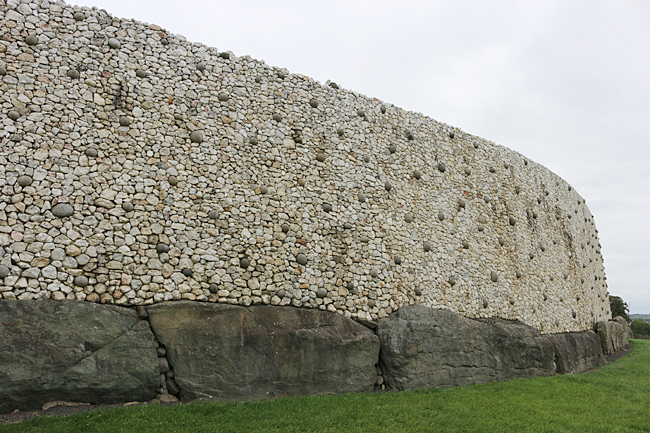 Outside, the white quartz stones and round dark granite rocks on the exterior wall along the front of the passage tomb were added later and were not part of the original construction. 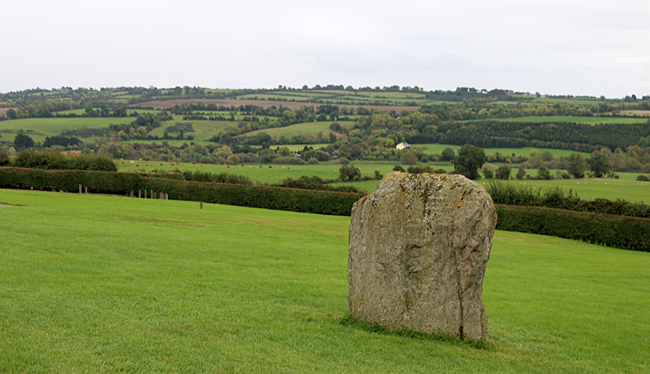 Two of the stones which surround Newgrange. Photograph ©2014 by Brian Cohen. 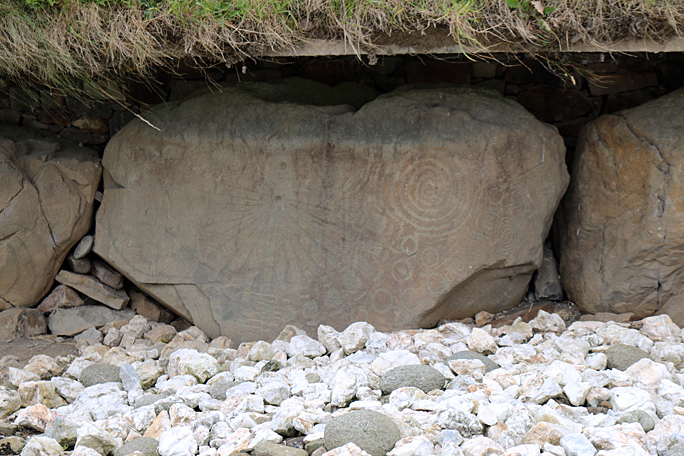 A closer view of one of the stones which surround Newgrange. Photograph ©2014 by Brian Cohen. 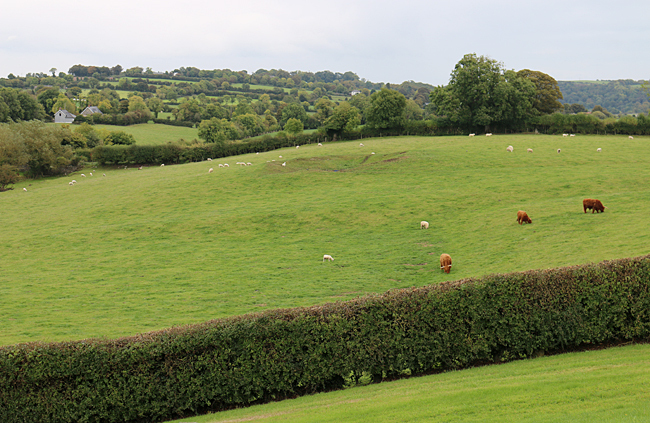 Even the theories of Newgrange by the cows in an adjacent field are as valid as those of the experts. Photograph ©2014 by Brian Cohen. 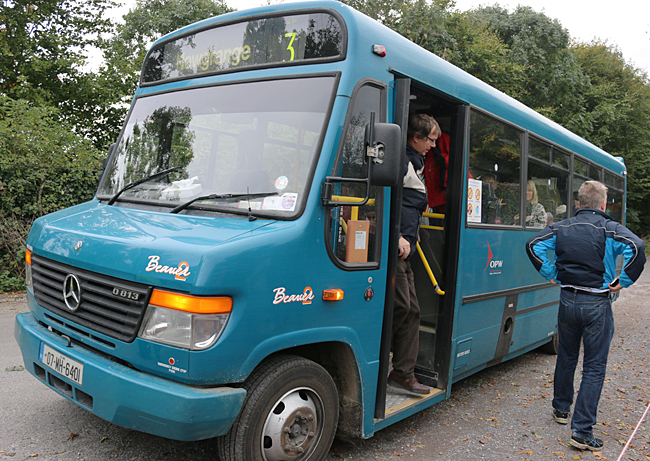 The bus which transports passengers between the visitor centre and the passage tomb of Newgrange. Photograph ©2014 by Brian Cohen. 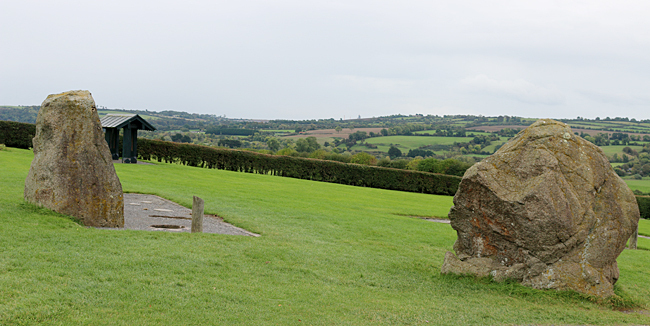 Similarly to Stonehenge, there are free-standing stones which surround the passage tomb. Their purpose is unknown; although they are thought to have had a function related to astronomy. The stones are not nearly as tall as those found at Stonehenge. It was time to take the blue bus on to Knowth. Built greater than 5,000 years ago, the Great Mound at Knowth is similar in size to Newgrange; and is surrounded by 18 smaller satellite mounds. 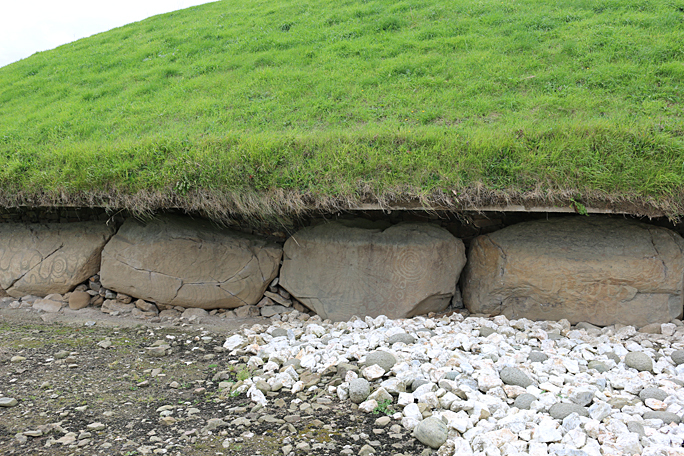 Examples of megalithic art are found on the kerbstones surrounding the mounds — such as the ones shown in the photographs above and below. 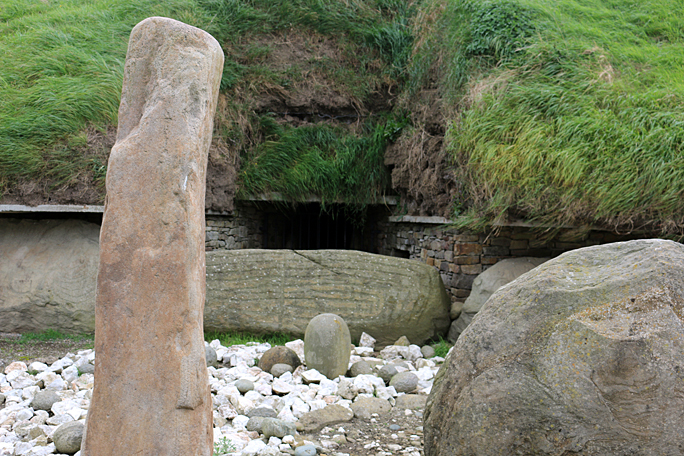 Knowth boasts the greatest concentration of megalithic art in Europe with its greater than 300 decorated stones. The guide remarked about the phallic symbolism of the elongated erect stone shown in one of the photographs below. It was supposedly regarded as a place of fertility for women. 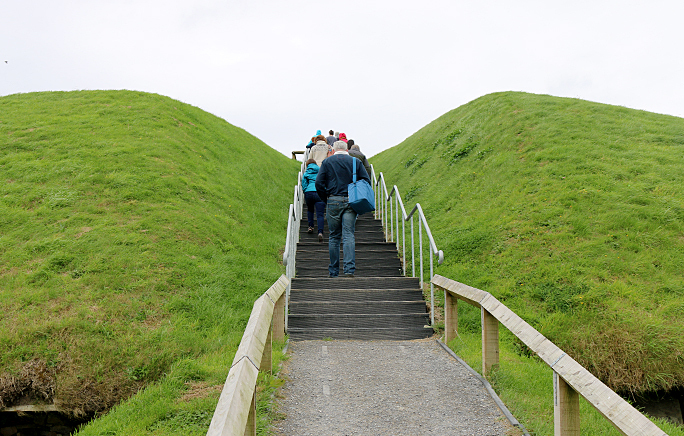 Guests were invited to climb the stairs to the top of the mound. Photograph ©2014 by Brian Cohen. 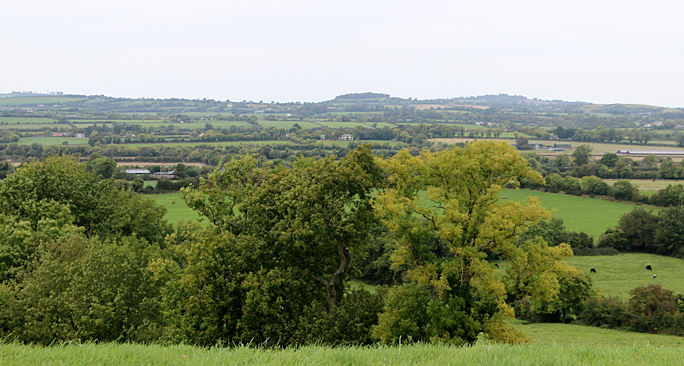 The views were nice; but not as scenic as from Newgrange. Photograph ©2014 by Brian Cohen. This elongated erect stone was supposedly regarded as a place of fertility for women. Photograph ©2014 by Brian Cohen. The entrance fee for Newgrange costs six euros per person; and the entrance fee for Knowth costs five euros per person — both of which include admission to the exhibition in the Brú na Bóinne Visitor Centre; although reduced admission prices are available to senior citizens, groups, children and students. 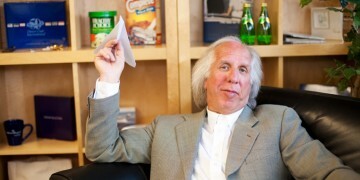 Tickets are sold in person on a first-come, first-serve basis. Factor in approximately three hours to visit everything, depending on your interest. No photography or videography is permitted inside the chamber at Newgrange; but they are allowed inside one chamber at Knowth. 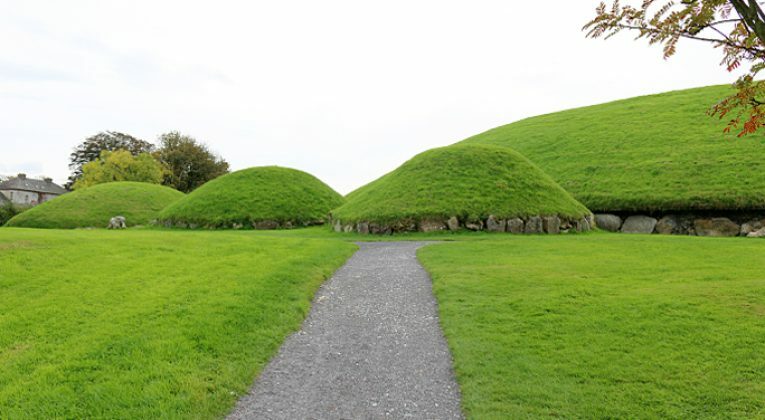 To get to Newgrange and Knowth — which are both located in County Meath approximately 38 kilometers north of Dublin — drive on the M1 highway north from Dublin to junction 9; and at the roundabout, turn left and head west on Donore Road. Newgrange and Knowth are located fewer than five kilometers from the exit of M1 — and the signage is quite clear, as you will not get lost. Be aware, however, that there is a toll of €1.90 each way on M1 at a toll plaza located between junctions 7 and 8 near Dardistown; so have your cash ready — unless you decide to exit at junction 7 to take route R132 north to Drogheda and turn left onto Donore Road in order to avoid paying the toll. 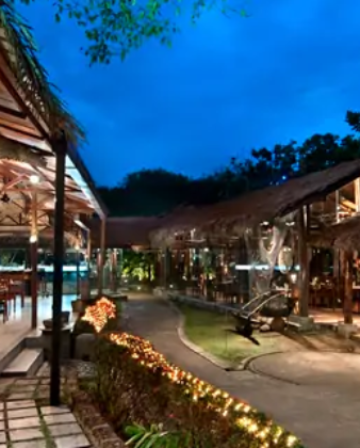 Everything is open seven days per week — with the exception of a few days per year; and those exceptions change each year. Business hours change also, depending on the time of year; and there are other special admission rates. Click here for more details and updated information. There are many questions which have yet to be answered pertaining to Newgrange and Knowth; and we were repeatedly told by the official guides that our theories are just as valid as those of the experts. 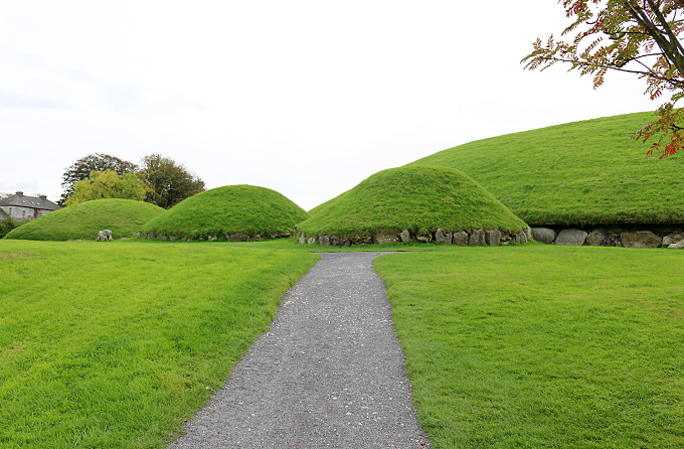 Perhaps you should consider visiting Newgrange and Knowth — which I highly recommend — and arrive at your own conclusions.